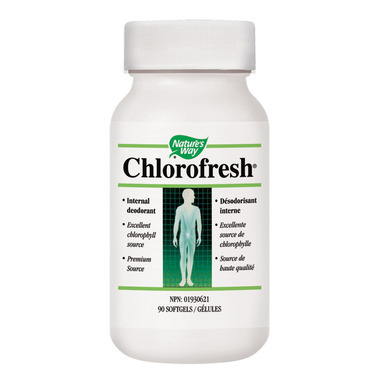 Chlorofresh is a concentrated chlorophyll complex from premium mulberry leaves that reduces digestive tract odours. Nature's Way Chlorofresh is safe, effective and easy-to-use. Directions: Adults: Take one to two softgels mornings and evenings. Other Ingredients: Soybean oil, [gelatin, glycerin, water (softgel)], yellow beeswax, soy lecithin. The only one I found. Usually They offer the chlorophyll dry in softgel, I prefer it on liquid form.